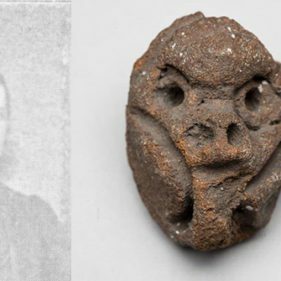 Som många av bloggens läsare känner till besitter Medelhavsmuseet ett unikt och omfattande arkeologiskt material från en mycket tidig bosättning i det egyptiska Deltat, Merimde Beni Salama. Denna samling har studerats flitigt av forskare från olika håll de senaste åren i syfte att ta reda på mer om människorna som bodde där, alltså långt innan Egypten blev den civilisation vi så väl känner till från den faraonska tiden. En mängd tekniker och infallsvinklar har tillämpats i syfte att få fram så mycket information som möjligt ur materialet, och forskningen är i allra högsta grad pågående – tidigare rapporter hittar du här, här och här! 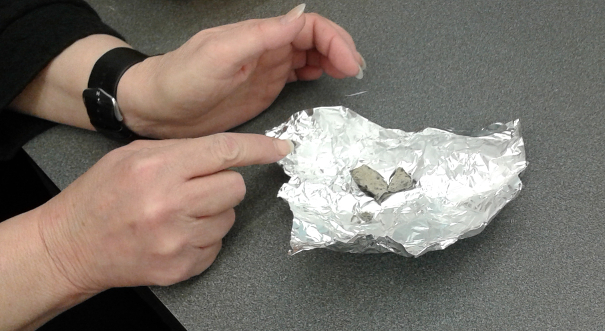 Pot sherd fragments being prepared for organic residue analysis. When Jo [Joanne Rowland] and I met in Berlin last year and first discussed the possibility of analysing some potsherds from the Neolithic settlement of Merimde Beni Salama I was very excited. Up to now there has been virtually no organic residue analysis carried out on Egyptian Neolithic pottery, despite its obvious potential. So after some correspondence with Carolin Johansson and colleagues from the Medelhavsmuseet in Stockholm it was agreed I would carry out analysis on a sample set of ten potsherds to test the preservation of possible organic residues. 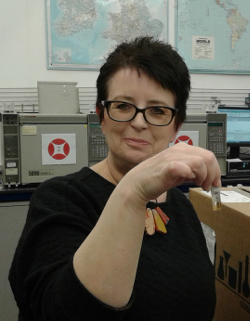 Thank you Carolin – your help has been very much appreciated and I hope you’ll be pleased with the fantastic results! Arrangements were made, although not altogether easily as we had to coordinate Stockholm, Berlin and Bristol and, thus, one cold January day, Jo very kindly flew from Berlin to Stockholm to collect the potsherds and then back to Heathrow. We’d agreed I would come to Heathrow to collect them from her, the least I could do after her day of travelling! Our handover of the sherds (at Heathrow Airport) had a slightly surreal feel! It was rather like being in a nineties spy movie. It felt like we should have (wearing raincoats and dark glasses) each sidled up to a random bench in the park and sat down without looking at each other. Jo should then have placed the ‘package’ between us on the bench under a newspaper and got up and left. I’d then have casually picked it up and walked off in the opposite direction! All very John le Carré! As it was, more prosaically, we had a coffee and a chat and Jo headed off to Southampton and I headed off back down the motorway back to Bristol, pottery securely clasped in my excited hands. Back at the lab the next morning – the first sight of the potsherds is always thrilling. My mind immediately jumps to the people who made the pots and I marvel at the craftsmanship that has gone into their making. How interesting the human desire to decorate things and what a shiver goes down my spine when I see the fingernail impressions from a Neolithic Egyptian on one of the Merimde potsherds! I think about the lives of the people who used the pots and I wonder about the pots themselves, were they treasured cooking pots, regularly used or might they have been made and admired for their visual aesthetic, perhaps used in ceremonies or deposited in graves? That is something I can try to answer! 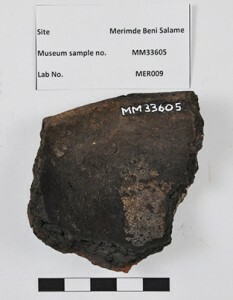 Sherd MM 33605 with burnt on residue. The lighter spot is where I have scraped some off to analyse. So, let me explain how I carry out organic residue analysis. 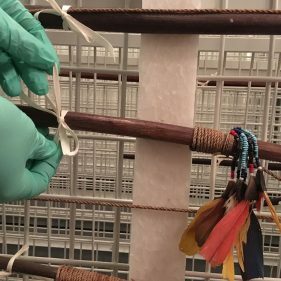 It should be said that although the technique of organic residue analysis is destructive, I am always conscious of the importance of these thousands of years old artefacts and hope that the potential outcome, i.e. the information we can gain from the pots, helps to mitigate this. The technique can tell us much about ancient diet as the lipids we extract from the pots come from the fats, oils and waxes of the natural world. Thus, to date, we have been able to identify the processing of ruminant and non-ruminant carcass and ruminant milk products, aquatic products, plants, beeswax and tree resins in ceramic vessels across a wide range of geographical and chronological contexts. Firstly, I clean the outside of a small corner of the pot, using a modelling drill. This should remove any contamination, such as finger lipids from anyone who has handled the sherd or things such as suncream or other cosmetic products that come from handling. Once I have an area around 2cm x 2cm clean, this is then broken off and wrapped in tin foil with solvent washed tweezers. We are very careful to minimise contamination and from now on the cleaned sherd will not be touched by human hands. Incidentally, it was very exciting to find some carbonised residue on the inside of the sherd labelled MM 33605. This is normally used by archaeologists for radiocarbon dating. How remarkable to think that someone’s burnt remains of a meal has survived for over 6000 years! I take a sample of this as well as it can be analysed in the same way as the absorbed residues. The next step is to crush the sample of the sherd using a pestle and mortar to release the lipids from the ceramic matrix. The powder is then weighed and an internal standard added (so we can quantify the lipids present). I then use a methanolic acid extraction procedure, which we do in batches of ten, together with a blank to ensure that I am not introducing any contamination. This takes pretty much all day and I would then be aiming to run the derivatised extracts on what is called a GC (Gas Chromatograph) overnight. This tells us whether any compounds are present, and, if there are, I’d then run the samples on a GC-MS (Gas Chromatograph-Mass Spectrometer) to identify what they were. Finally, I’d carry out isotopic analysis, using a GC-C-IRMS (Gas chromatograph-Combustion-Isotope Ratio Mass Spectrometer). This allows us to determine the origin of animal fats – the most common finding in prehistoric pottery. 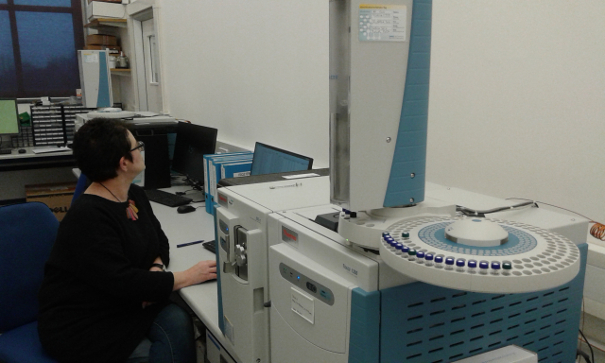 Julie working with the GC-MS.
I’m very pleased to say the results from Merimde were excellent with eight of the ten potsherds containing lipids. This is a very good recovery rate, comparable to other North African sites and much better than European Neolithic sites where preservation isn’t as good. Two of them had very high C16 and very low C18 fatty acids which indicates the likely processing of plants in the pots. 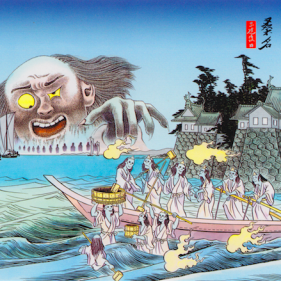 Six had both C16 and C18 fatty acids (often in high abundances). These display typical degraded animal fats profiles and so I carried out isotopic analysis on these to determine their origin. As you can see from the plot below these preliminary results show that the majority of animal fats processed in the vessel (four plus the external residue) come from a non-ruminant origin and two from a ruminant fat origin. Big delta plot showing the origin of the animal fats processed in the Merimde ceramic vessels. It’s really important at this stage to look at this information in the light of the faunal remains present at the site as well as what is known about the presence in the region of domesticated species at the time of the Egyptian Neolithic. The fact that the majority of the animal products originate from non-ruminants might suggest hunting of wild fauna is more prevalent, however, we also need to determine whether cattle, sheep or goat remains were found at the site as the two samples that plot in that area might also come from wild ruminant species. Further work would also include special screening of the residues to see if any aquatic products were processed in the vessels. After all, the site is near the Nile so it is entirely possible fish may have been part of the diet of these people. 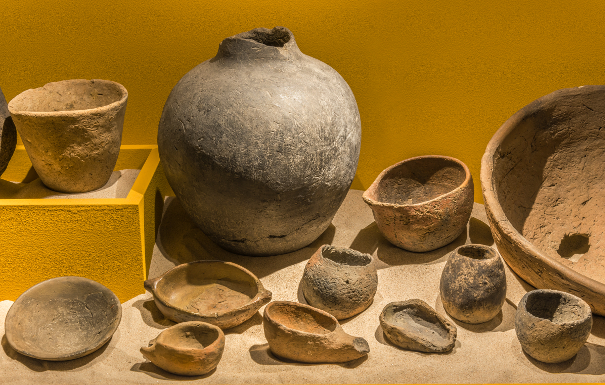 Significantly, the stable carbon isotopes (δ13C) on lipid residues from the pottery can also provide a powerful environmental proxy. 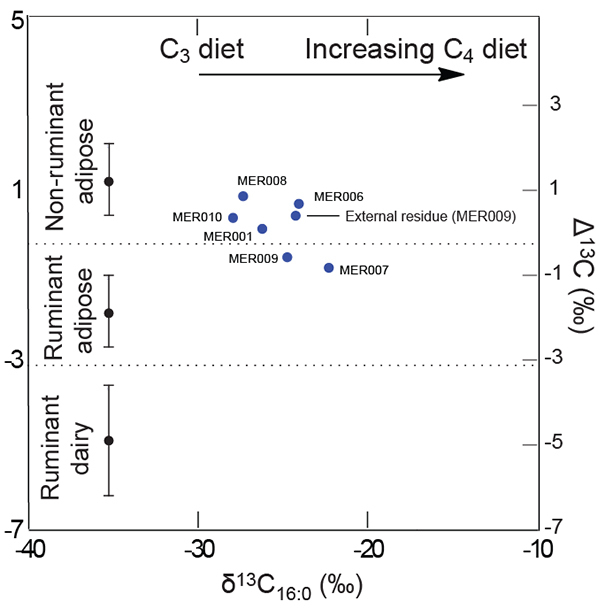 The δ13C16.0 values (which show the values of the plants that the animals have been eating, e.g C3 versus C4 plants) from our pilot data, suggests some C4 plants are present in the environment, implying a certain level of aridity in the area. For the future, now that we know the preservation is so good, it would be very useful to analyse a larger sample set to build up a picture of diet and subsistence practices of the Neolithic people at Merimde. Julie at work with one of the samples. Dr Julie Dunne is a researcher at the University of Bristol, specialising in analysis of organic residue. 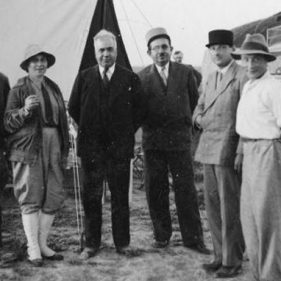 Dr Joanne Rowland is currently field director of the new investigations at Merimde Beni Salama, Western Delta, Egypt, and also head of the TOPOI Excellence Cluster Berlin Research Project A-2-4 ‘The Neolithic of the Nile Delta’.